This application is no longer being developed or maintained. I recommend that users migrate to GnuCash, a much better program and one that in most cases successfully imports PLCash QIF-format exported accounts and data. This page exists only to allow legacy PLCash users to acquire new executables, not to encourage adoption of this program for new accounts. PLCash is a platform-independent personal financial program. Create and manage personal financial accounts. Import and export data from/to Quicken and other financial programs. Create reports and analyze your transactions using a sophisticated report generator. Import prices to track the performance of your investments. Interface with many other programs intuitively, using an industry-standard, transparent data file format. Reconcile your records with bank statements. Print checks in a variety of ways. PLCash takes advantage of some of the newer features of Java to create a powerful, easy-to-use personal financial program. Because PLCash is written in Java, it will run on virtually any computer you can name — any computer for which there is a version of the Java 1.5 or newer runtime engine. Oh, I almost forgot the other good news. PLCash is CareWare — that means no money, now or ever. You just have to care. Click here to read the online PLCash documentation (it's the same documentation that comes with the program). Since a major rewrite at Version 2.1, PLCash should support most locales and numeric conventions, although I obviously haven't tested the properties of every locale. Please report any locale-related difficulties to my message board. First, read "A note about Freeware"
Windows users: Download the Windows install package PLCash.exe (725 KB) . All others: Download the Java program PLCash.jar (607 KB) . Security check: Click here to see the md5sum value for the current PLCash.jar executable. Just download your choice of PLCash package, install it, then acquire a current Java runtime engine, install it, then run PLCash. Windows only: navigate to the program directory, click the handy program icon. You can place copies of this icon wherever you please. Windows and all others: From a command shell, move to the program directory and type "java -jar PLCash.jar". This command can easily be made the contents of a shell script. Then click "Help" for instructions. Please be careful with your financial records. Never place sole reliance on any one program for maintaining the integrity and security of your financial records. PLCash is a powerful program with all sorts of neat features, but it is not bullet-proof (no program is). Don't rely on PLCash alone or a single copy of your data files — always maintain backups. PLCash is © Copyright 2009, Paul Lutus — Message Page. PLCash is CareWare (meaning for all practical purposes, it's free). Hello Paul, I purchased the PL Cash on e-bay and I'm very happy with it. All right. Can you tell me from whom you "purchased" my free program? I ask this so I can more easily have him thrown in jail. PLCash is a free computer program. It is not for sale. Here is the PLCash Home Page: http://arachnoid.com/PLCash. Apart from the crime you have reported to me, the PLCash Home Page page is the only secure way to acquire PLCash — if you acquire it from another source, you risk getting an infected, insecure copy. From the PLCash Home Page you can download PLCash for free. PLCash will be free tomorrow. Anyone who sells PLCash (or any of my other dozens of free programs) is guilty of at least one felony federal crime (sale of stolen property by way of interstate commerce), and probably more. If you move the Program Files directory to an external drive, but not Documents and Settings and then erase the original drive, everything in Documents and Settings will be erased — meaning all your data. I'm saying it this way to emphasize that this is true for all programs, not just PLCash — modern operating systems, modern computer programs, store data separately from programs. Your personal data are all located under "C:\Documents and Settings", not "C:\Program Files". Your programs are all located under "C:\Program Files", not "C:\Documents and Settings". Before being erased, your personal financial records were located on your main system drive, under the directory "C:\Documents and Settings", along with all your other personal data. Before being securely moved to the new system, a copy of PLCash, which you can get any time for free, was pointlessly moved for safekeeping onto your external drive under "\Program Files". I update from Vista to Win 7 and re installed the PLCash program. It look like I lost all the previous data, but maybe not ? I see the folder on my External Drive, but when I click on it, system is asking me to start all over. Is there hope that the data are stored somewhere ? Until now, you didn't know where your personal financial records were stored. But there's an easy solution — recover with your backup data disk. You do have a backup data disk, yes? A complete copy, made weekly, of the contents of "C:\Documents and Settings"? Making backups is how we save ourselves from losing everything computer-related that is important to us. So get hold of that backup disk, the one that all intelligent computer users make weekly. All your hard work will be located there. But more important than anything, I want to know the name of the criminal who sold you my free program. With that name in hand, I will pick up the telephone, call the police and the FBI, and that person's existence as a free person will end. I want to emphasize something — if you acquired PLCash from a third party, not from the PLCash Home Page, the possibility exists that it was hacked and recompiled to automatically send all your account numbers and financial data to a criminal for exploitation. You know — the same criminal who sold you my free program? I await your reply. So does a certain criminal, even though he doesn't know it. Thanks for writing — I had no idea people were trying to sell PLCash. Editorial note: The above is a real user message — I didn't make it up. And it's too fantastic to be a fantasy. When I first read it, it came to me that in the long sweep of human history and in retrospect, the introduction of the personal computer will be recognized as nearly the biggest opportunity for exploitation ever devised, second only to religion. 11/18/2016 Version 2.5 Build 2415. Changed the Windows launch procedure after discovering that Microsoft has stopped supporting Java. 10/15/2016 Version 2.5 Build 2398. Fixed an error that prevented certain system notifications from being routed to the program error log. 09/24/2014 Version 2.4 Build 2392. Fixed a bug that prevented correct splits transaction processing in non-US locales. 03/08/2013 Version 2.3 Build 2388. 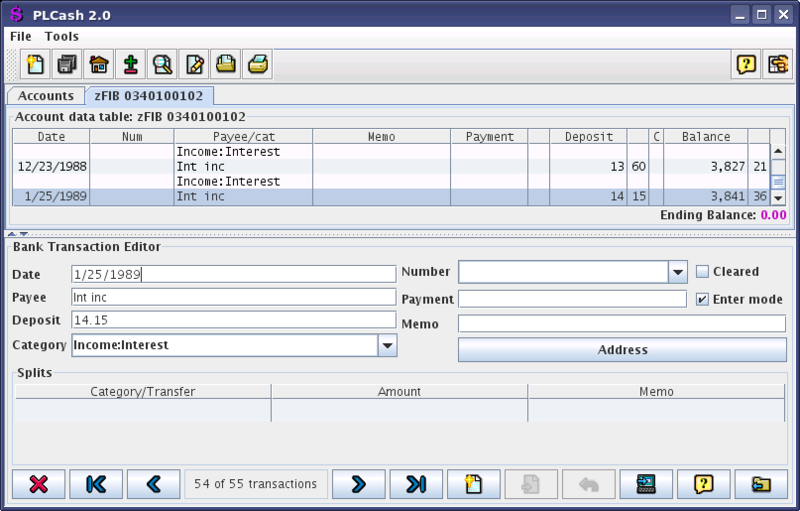 Corrected an untrapped error condition in the bank account editor pane. 03/07/2013 Version 2.3 Build 2382. Adopted a more consistent number format in QIF exports. 01/24/2013 Version 2.2 Build 2374. Added convenient mouse-wheel control to all date entry fields. 09/26/2011 Version 2.2 build 2367. Restored a practical cross-platform user-feedback beep. 09/25/2011 Version 2.2 build 2362. Revised code to use antialiased font display -- much better appearance. 08/23/2009 Version 2.1 build 2355. Added program exit menu item for those without a window-closing option in their chosen desktop style. 04/11/2009 Version 2.1 build 2348. Cleaned up some small bugs, adjusted printing dialog size. 04/07/2009 Version 2.1 build 2322. Fixed a minor Look & Feel issue affecting the Linux and Macintosh platforms. 03/29/2009 Version 2.1 build 2317. Extensively reworked this application's code to more robustly deal with locale issues. It should function well in most European locales, and I would appreciate reports of any locale-related difficulties to my message board. 02/03/2009 Version 2.0 build 2207. Corrected some syntax and formatting issues in the HTML created by the report generator. 10/21/2008 Version 2.0 build 2201. Corrected documentation to clarify that regular expression arguments must be enclosed in quotes. 02/05/2008 Version 2.0 build 2197. In response to an error report, reworked code in data file reader. 04/03/2007 Version 2.0 build 2161. Changed to target Java runtime version 1.5. This recent series of changes moves PLCash from Java 1.4.2 -> 1.5, with consequent improvements primarily in appearance and launch speed. 04/03/2007 Version 2.0 build 2159. Updated Java required runtime target to 1.6. 04/02/2007 Version 2.0 Build 2157. Upgraded and recompiled to Java 1.6. Some users will need to update their Java runtime engines at http://java.com. 01/30/2005 Version 2.0 Build 2152. Fixed a subtle bug in the computation of investment account market values using share balance and price. This bug has no effect on investment account recordkeeping, which relies on share balance, not market value. It only affects displayed market values. 12/13/2003 Version 2.0 Build 2148. Modified help files and program dialogs to emphasize something perverse about browser searches (any drive letters must be uppercase). 12/13/2003 Version 2.0 Build 2147. Once again revised browser search code to try to accommodate filesystems with drive letters. 12/10/2003 Version 2.0 Build 2144. Fixed an additional bug in the browser search code. 12/09/2003 Version 2.0 Build 2143. Fixed a problem, and updated the documentation, to deal with a browser-locating problem in OS/2. Those who download this build as an upgrade to an existing installation should execute "Tools ... reinstall documentation files". 11/28/2003 Version 2.0 Build 2141. Changed version test code to accommodate some Java VMs that have nonstandard characters in their version strings. 11/24/2003 Version 2.0 Build 2137. Fixed a bug that prevented the payee name from being copied into a transaction link. 11/20/2003 Version 2.0 Build 2137. Added sound feedback for transaction commit/delete operations. 10/21/2003 Version 2.0 Build 2135. Added an error message logging feature to help in the diagnosis of runtime errors. 10/19/2003 Version 2.0 Build 2133. Fixed a bug in the browser search algorithm that rejected certain kinds of paths. 10/17/2003 Version 2.0 Build 2129. Corrected an error in the QIF file import of splits transactions. 10/17/2003 Version 2.0 Build 2127. Added code to deal with a few more peculiar splits/investment transaction entry possibilities. 10/16/2003 Version 2.0 Build 2125. Automated the handling of an error condition in split investment transactions in which the splits net amount ends up contradicting the chosen action type. 10/16/2003 Version 2.0 Build 2124. Updated documentation to reflect recent changes. To update your documentation files on a pre-existing PLCash installation, install this build, then click Tools ... Reinstall Documentation Files. 10/16/2003 Version 2.0 Build 2123. Changed splits entry editor to allow signed (+,-) entries. Made appropriate adjustments elsewhere to accommodate this. 10/16/2003 Version 2.0 Build 2120. Fixed a bug in memorized transaction handling. The program was not correctly saving and recalling any splits present in memorized transactions. 10/14/2003 Version 2.0 Build 2117. Improved the intelligence of the QIF data file import procedure. Now the security associated with each investment account is arrived at if possible (it is not included in the QIF account list from Quicken), also security prices and the security list are updated at the end of each QIF import. 10/12/2003 Version 2.0 Build 2114. Corrected a boundary condition in the report generator that prevented use of certain time intervals. 10/11/2003 Version 2.0 Build 2107. Fixed documentation files to accommodate an MSIE misbehavior. 10/11/2003 Version 2.0 Build 2105. Fixed a few small last-minute bugs. 10/11/2003 Version 2.0 Build 2103. First release of a completely rewritten program. Many new features. 05/07/2003 Version 1.02. Fixed a file path error associated with creation of new accounts. 04/30/2003 Version 1.01. Fixed a bug that prevented correct QIF import in some cases. 04/21/2003 Version 1.00. First non-beta release. Cleaned up a few minor user-reported bugs. Added a shortcut creator for Linux platforms and an about dialog. 04/21/2003 Version 0.94 Beta. Fixed some minor bugs, changed the way new accounts names are assigned, changed method to allow partial QIF imports into existing accounts. 04/21/2003 Version 0.93 Beta. Fixed an inconsistency in the handling of new account names. 04/18/2003 Version 0.92 Beta. Fixed a handful of small bugs including one that tried to put the search window in the same location as the program toolbar. 04/17/2003 Version 0.91 Beta. Fixed a bug that failed to create a single default entry in an otherwise empty list, for each of the list types. 04/17/2003 Version 0.90 Beta. Initial public release.